Historic St. Mary's City, an outdoor museum, is the site of the fourth permanent settlement in British North America, Maryland's first capital and a birthplace of religious toleration. Come explore the lifeways of Maryland's first citizens through an exciting mix of colorful living history and fascinating archaeology, all set in a beautiful Tidewater landscape along the St. Mary's River, a tributary of the Potomac. Costumed living history interpretation, walking trails, exhibits, on-going archaeological investigations and volunteer opportunities. Special events are scheduled on weekends from March through December; visit the Historic St. Mary's City events listing for details. 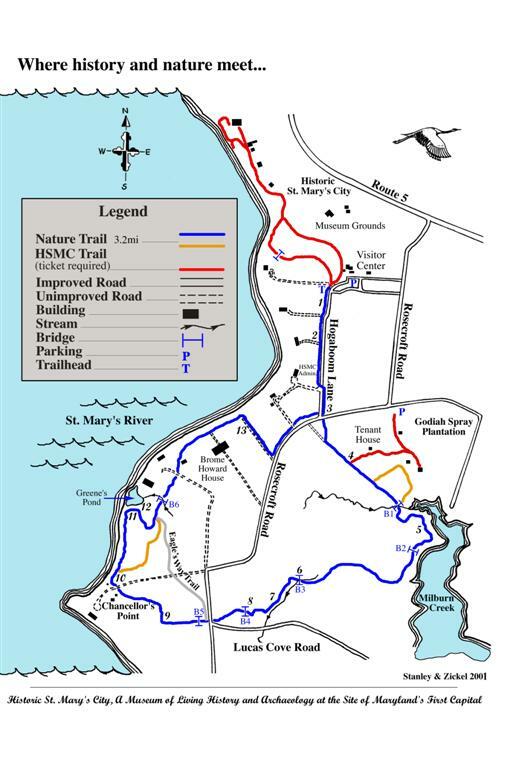 Hiking Trails: Explore the wild side of Historic St. Mary's City, the museum of living history and archaeology on the site of Maryland's first capital. Park at the Visitor Center (18751 Hogaboom Lane), then head south, away from the exhibits. Travel a three-mile trail through 700 acres of woods and fields at water's edge. Pick up a trail guide at the trailhead. A map and information about area history, flora and fauna, and some of the people who once lived in the area will help you get the most out of your walk. No ticket is required and dogs are allowed on leash. Open seven days a week, sunrise to sunset. Exhibits include the square-rigged ship, the Maryland Dove, Godiah Spray's fine tobacco plantation, the State House of 1676, marked sites of 17th century buildings, and a Woodland Indian Hamlet. At the Visitor Center you can see an introductory video and exhibits on the history and archaeology of St. Mary's City and visit the Museum Shop. The Visitor Center and Exhibits are handicapped accessible. In the late 16th and early 17th centuries, England began efforts to develop a New World empire in North America. The beginnings were financed by allowing entrepreneurs, some of them joint stock companies, some of them individual proprietors, to establish colonies along the Atlantic seacoast. In 1632, Cecil Calvert, the second Baron of Baltimore, was granted a charter to what is now the state of Maryland. In the Maryland charter, largely written by Calvert, the king granted the Calverts princely rights, with the power to raise an army, collect taxes, make laws, and give away land. Clearly, the King held George Calvert in high regard, despite his religious convictions. The second half of the century was St. Mary’s heyday, marked by a strong tobacco economy and growth in population that warranted construction of public buildings. For a time, the colony offered remarkable opportunities for economic and social advancement to those endowed with the ability to work hard and a bit of luck. But political and religious animosity again arose late in the century and a group of disgruntled Protestants led a revolution against Lord Baltimore in 1689. The crown appointed royal governors and they moved the capital from St. Mary’s City to Annapolis in 1695. The colonial statehouse was turned into a Protestant (Anglican) church in the same year; and in 1704 the principle of liberty of conscience was dramatically overturned when Catholic churches and schools were closed in accordance with “An Act to Prevent the Growth of Popery within this Province.” Abandoned for the most part, St. Mary’s City sank back into the soil from which it had arisen and by the time of the American Revolution, little of Lord Baltimore’s capital was left but memories of its former importance.